Home / GERMANY 2017 / Sweden celebrates their first ever quarter-finals! Sweden went on to make history at the Arena Leipzig after the victory over Slovenia for 33-21 and advancing into the quarter-finals for the first time ever in a World Championship. The match itself lacked a bit of excitement as the Scandinavians outplayed the Balcanics. 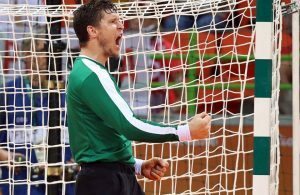 “It’s not today’s game that counts, it’s the eight-finals”, said Henrik Signell on Friday after the great victory against Norway for the last match of the group round, and he emphasized: “It gives us nothing more than a good feeling”. And although he said they should forget about it as soon as possible and focus on the next match, it’s clear to see that such a good victory had it’s positive consequences. The Scandinavians took control of the match and after 12 minutes they were leading 7-2. But three consecutive goals by Krim’s right wing Alja Koren put Slovenia back in the match (7-5, 15’) and Signell called the first timeout. When the match resumed, Sweden went on to set the record straight and established a +8 within the following 10 minutes. Slovenia was creating the chances, but whenever hey could surpass the tough Swedish defense, they encountered a very solid Johanna Bundsen, who’s brought with her the great level displayed in Bietighem-Bissingen during the group phase. The first 30 minutes finished with a score of 18-12 in favor of the Swedish. On the second half Slovenia continued to struggle while the captained by Sabina Jacobsen were widening the gap via fast breaks (26-15, 15’). The top scorer of the competition until yesterday, Ana Gros, was having a hard time trying to score (4 of 11) and that didn’t help the spirits of the team, who was finding it hard to break through both the defense and Bundsen. The final score was a comfortable 33-21 for Sweden who will now face Denmark. 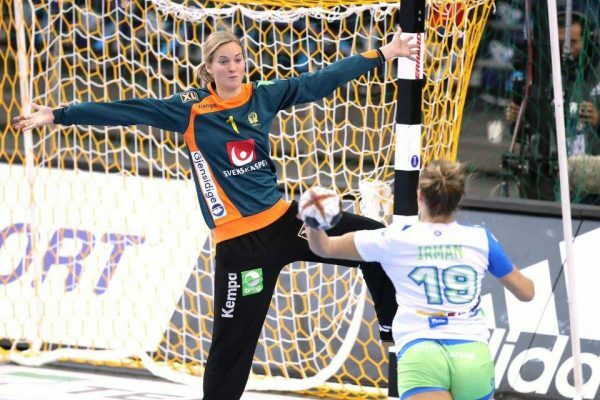 The top scorers of the match were Slovenia’s Koren and Sweden’s Johanna Westberg, both with 8 goals, while the MVP was awarded to Bundsen (48% of saves, 19/40). Isabelle Gulldén is probably one of the most determining players on this Swedish squad. She understood exactly the meaning of this match, but confessed that the fact that a pass into the quarter-finals would be historic for them was not exactly on their minds: “It was in some way, but we knew it would be a very hard match so we were really focused because we lost against them last year, and they played really good on this match. But we also knew that they had a really good starting 7 and if we could run with them and tire them, we had a good chance, and that’s what we did”. When asked about the boost of confidence they took from the win against the defending champions she said: “Of course beating Norway, and playing good gave us confidence, but we also knew that we can be a little bit like this (moves her hand up and down like in a wave), so we needed to forget about the win because if we lost against Slovenia the win against Norway didn’t matter so much. But you can see it gives us self confidence and you everyone is performing”. Denmark will be Sweden’s next rival in the quarter-finals, and they faced each other in two matches just before the championship. Regarding their next rivals, Gulldén said: “It will be a fight. The tactical things will be important, but we also know that they play really offensive in their defense and they have good shooters. On the second game against them we played really good, so we will look into both games and see what we did wrong and we will also look at what they did now (in the eigth-finals)”. Signell’s girls can now celebrate, but they will put on their game faces on Tuesday at 17:30 at the Arena Leipzig. ← Previous Story Les Bleues are through to the quarter-finals!